Friday evening didn’t bring any Torneo Inicial matches – those will be played over Saturday, Sunday and Monday – but it did feature a World Cup qualifying match in which Argentina dispatched Paraguay 3-1 in Córdoba with an expertly-finished goal from Ezequiel Lavezzi (flicking it in off his back – a real genius finish), a fine goal from Gonzalo Higuaín later in the first half, and a spectacular long range free kick from Lionel Messi, who thus became the first player since Hernán Crespo a decade ago to score in six consecutive games for Argentina. Paraguay’s goal came from the penalty spot, and was scored by Jonathan Fabbro, therefore all four goals were scored by Argentines (Fabbro recently took Paraguayan citizenship having lived there for five years). The highlights of the match are right here. You can follow the latest news from the selección and Argentina’s foreign legion of players, as well as the domestic championship and the ever entertaining/tragic/infuriating capers of Julio Grondona & chums direct from Buenos Aires with HEGS on Twitter. If you’ve not signed up yet you can do so here. You can also join the official HEGS Facebook group, to keep up to date with the latest posts on the blog and discuss things with other fans. You’ll find it here. And remember to bookmark Hand Of Pod, our Argentine football podcast, or if you prefer you can subscribe to it on iTunes here. 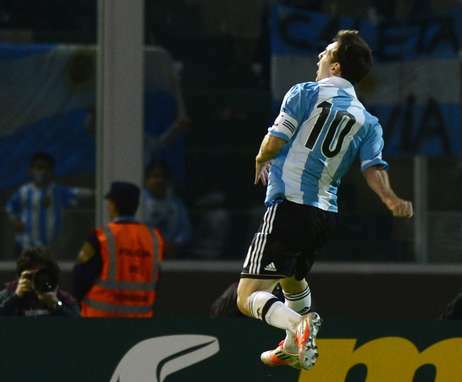 Oh Messi… fantastico. Vamos, vamos.